I needed an actual paperback to read while sitting at the pool and picked up Shattered by Dani Pettrey at the library. Yay for libraries! 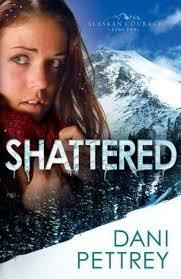 Shattered is book 2 in Pettrey’s Alaskan Courage Series. Piper McKenna is the heroine of this tale. When her youngest brother, Reef, is arrested for murder, she is determined to find out the truth, which means finding the killer. Heroes don’t come better than Deputy Landon Grainger. He has been an unofficially adopted member of the Grainger family and has known Piper for a long time. He knows that sometimes someone who professes innocence can really be guilty and he’s afraid Piper’s devotion to her brother will be her undoing. When Piper is almost killed, however, he begins to realize two things. One: He loves Piper as more than an annoying little sister. Two: Someone else has committed the murder Reef is in jail for. To solve a crime and protect Piper become his primary goals and when feelings begin to surface, life gets even more complicated. Will Piper and Landon get past this danger to confess their love? Can they prove Reef’s innocence? And will Landon resolve his mixed feelings towards God? This was a wonderful story that was hard to put down. Romantic suspense at it’s best and banter between Piper and Landon as they struggled with their deeper feelings for each other was fun to read. Even with a series and a cast of characters that considerable, Pettrey makes it easy to determine who is who and I think this book stands alone well enough. I am enjoying getting to know the McKenna family and those they have enfolded into their loving arms. This one sounds good too! Thanks for doing the groundwork so I don’t end up reading something that really isn’t worth the time and effort. I hate when that happens!